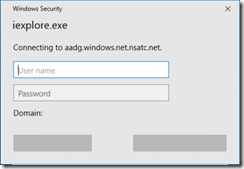 When configuring Azure AD SSO as part of Pass-Through Authentication (PTA) or with Password Hash Authentication (PHA) you need now (since March 2018) to only configure a single URL in the Intranet Zone in Windows. That URL is https://autologon.microsoftazuread-sso.com and this can be rolled out as a registry preference via Group Policy. Before March 2018 there was a second URL that was needed in the intranet zone, but that is no longer required (see notes). It has OK and Cancel on it as well, but my screengrab I made when I saw the issue was not brilliant, so I “fixed” the bottom of the image so its approx. correct! The URL is aadg.windows.net.nsatc.net. Adding this to Local Intranet Zone even though it is not needed does not fix the issue. The issue is caused because on Windows 10 (version 1703 and maybe others) someone has enabled Enhanced Protected Mode. 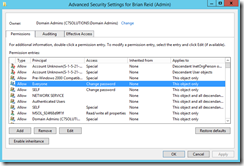 Azure SSO does not work when Enhanced Protected Mode is enabled. This is not a setting that is enabled on client machines by default. Enhanced Protected Mode provides additional protection against malicious websites by using 64-bit processes on 64-bit versions of Windows. For computers running at least Windows 8, Enhanced Protected Mode also limits the locations Internet Explorer can read from in the registry and the file system. It is probable that Enhanced Protected Mode is enabled via Group Policy. It will either have the value Isolation (or Isolation64bit) set to a value of PMEM at HKEY_LOCAL_MACHINE\SOFTWARE\Microsoft\Internet Explorer\Main or HKEY_CURRENT_USER\SOFTWARE\Microsoft\Internet Explorer\Main or the policy equivalent at HKEY_LOCAL_MACHINE\SOFTWARE\Policies\Microsoft\Internet Explorer\Main or HKEY_CURRENT_USER\SOFTWARE\Policies\Microsoft\Internet Explorer\Main when set via GPO settings. This issue is listed in the Azure AD SSO known issues page at https://docs.microsoft.com/en-us/azure/active-directory/connect/active-directory-aadconnect-troubleshoot-sso. The reason why Enhanced Protected Mode does not work with Azure AD SSO is that whilst Enhanced Protected Mode is enabled, Internet Explorer has no access to corporate domain credentials. Microsoft recommends that you stay on top of version updates to AADConnect. In version 1.1.553.0, which became available in June 2017, there is a reference to a gain in admin privileges that could be possible with password writeback (part of Azure AD Premium and EMS licences) that hints at a security issue. The following is what I think the issue is, and therefore why you should be running 1.1.553.0 or later. 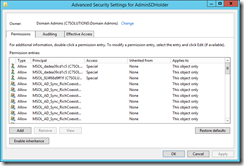 Global admins can change the password of AD admins using Azure Portal. This is an issue if you consider the following scenario – if the GA was just a delegated admin to an OU or not an admin to AD at all (i.e. cloud only admin) they would not be able to reset privileged accounts in AD, but with password writeback prior to v 1.1.553.0 they are able to do this and gain an on-premise privilege they did not have. Or, of course, malicious actor takes over GA account and now have access to all on-premises admin accounts. Following version 1.1.553.0 and later, only the owner of a privileged account can change it via password writeback. So, if you have cloud admins that are not on-premises admins, or are just delegated admins on-premises, upgrade to 1.1.553.0 now. Login to your Azure AD Connect server. Start Azure AD Connect wizard (START → Azure AD Connect). On the Welcome screen, click Configure. On the Tasks screen, select View current configuration and click Next. Under Synchronization Settings, check if Password Writeback is enabled. For information on how to upgrade Azure AD Connect, refer to Azure AD Connect: Learn how to upgrade from a previous version to the latest. It checks if the target on-premises AD account is a privileged account by validating the AD adminCount attribute. If the value is null or 0, Azure AD Connect concludes this is not a privileged account and permits the Password writeback request. If the value is not null or 0, Azure AD Connect concludes this is a privileged account. Next, it then validates whether the requesting user is the owner of the target on-premises AD account. It does so by checking the relationship between the target on-premises AD account and the Azure AD account of the requesting user in its Metaverse. If the requesting user is indeed the owner, Azure AD Connect permits the Password writeback request. Otherwise, the request is rejected. AdminSDHolder is something I come across a lot, but find a lot of admins are unaware of it. In brief it is any user that is a member of a protected group (i.e. Domain Admins) will find that their AD permission inheritance and access control lists on their AD object will be reset every hour. Michael B. Smith did a nice write-up on this subject here. 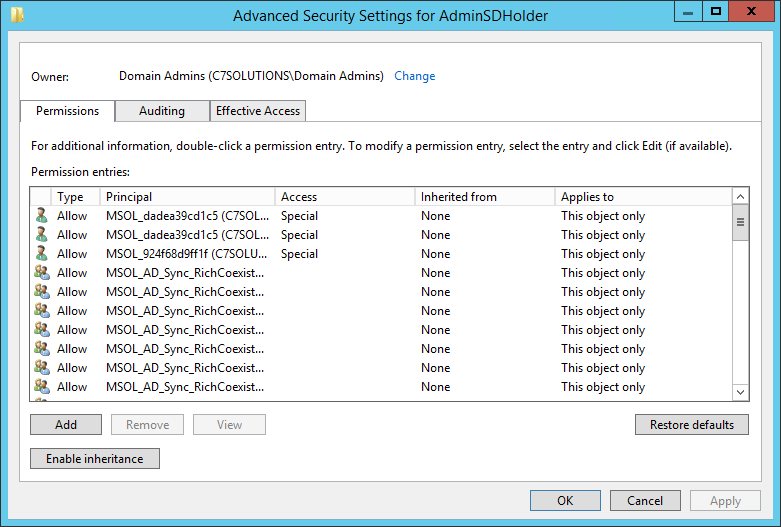 AdminSDHolder is an AD object that determines what the permissions for all protected group members need to be. 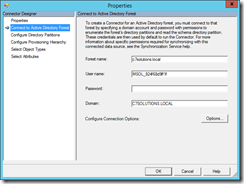 Why this matters with AADConnect and your sync to Azure Active Directory (i.e. the directory used by Office 365) is that any object that the AADConnect service cannot read cannot be synced, and any object that the AADConnect service cannot write to can be targeted by writeback permissions. This blog post was last updated 18th June 2017 in advance of the release of AADConnect version 1.1.553.0. For the read permissions this is less of an issue, as the default read permissions by every object is part of a standard Active Directory deployment and so you will find that AdminSDHolder contains this permission and therefore protected objects can be read by AADConnect. This happens in reality becase Authenticated Users have read permissions to lots of attributes on the AdminSDHolder object under the hidden System containing in the domain. 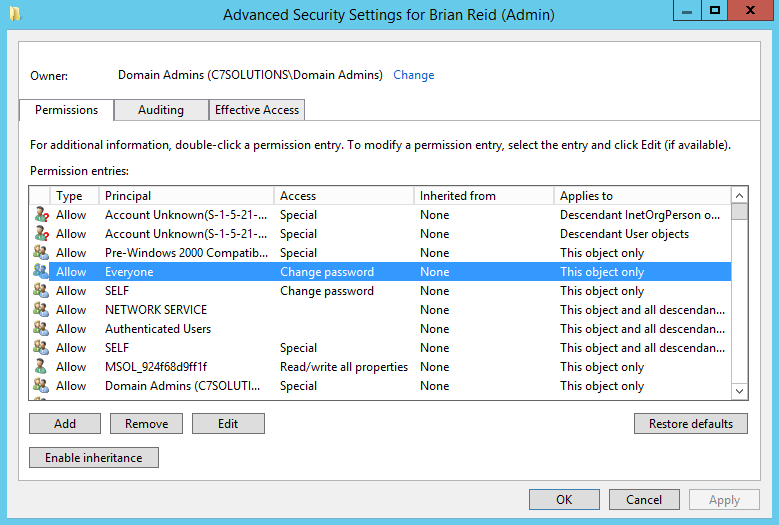 Unless your AD permissions are very locked down or AdminSDHolder permissions have been changed to remove Authenticated Users you should have no issue in syncing admin accounts, who of course might have dependencies on mailboxes and SharePoint sites etc. and so need to be synced to the cloud. Writeback though is a different ball game. Unless you have done AADConnect with Express settings you will find that protected accounts fail during the last stage of AADConnect sync process. You often see errors in the Export profile for your Active Directory that list your admin accounts. Ofter the easiest way to fix this is to enable the Inheritance permission check box on the user account and sync again. The changes are now successfully written but within the hour this inheritance checkbox will be removed and the default permissions as set on AdminSDHolder reapplied to these user accounts. Later changes that need written back from the cloud will result in a failure to writeback again, and again permission issues will be to blame. To fix this we just need to ensure that the AdminSDHolder object has the correct permissions needed. This is nothing more than doing what the AADConnect Express wizard will do for you anyway, but if you don’t do the Express wizard I don’t think I have seen what you should do documented anywhere – so this is the first (maybe). 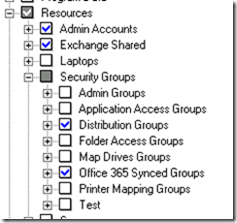 Often if you don’t run Express settings you are interested in the principal of least privilege and so the rest of this blog post will outline what you will see in your Active Directory and what to do to ensure protected accounts will always sync and writeback in the Azure Active Directory sync engine. I covered the permissions to enable various types of writeback permissions in a different blog post, but the scripts in this post never added the correct write permissions to AdminSDHolder, so this post will cover what to do for your protected accounts. You will see in the Advanced permissions dialog that their is an “Enable Inheritance” button (or a check box is unchecked in older versions of Active Directory. You will also notice that all the permissions under the “Inherited From” column read “None” – that is there are no permissions inherited. You will also see, as shown in the above dialog, that if Express settings have been run for your AADConnect sync service that a access control entry for the AADConnect service account will be listed – here this is MSOL_924f68d9ff1f (yours will be different if it exists) and has read/write for everything. This is not least privilege! If you have run the sync engine previously on different servers and later removed them (as the sync engine can only run on one server to one AAD tenant, excluding staging servers) then you might see more than one MSOL account. The description field of the account will show what server it was created on for your information. If you compare your above admin account to a non-protected account you will see inheritance can be disabled and that the Inherited From column lists the source of the permission inheritance. Compare the access control entries (ACE) to the list of ACE’s on the AdminSDHolder object. AdminSDHolder can be found at CN=AdminSDHolder,CN=System,DC=domain,DC=local. You should find that the protected accounts match those of the AdminSDHolder, or at least will within the hour as someone could have just changed something. Add a permission ACE to AdminSDHolder and it will appear on each protected account within an hour, remove an ACE and it will go within the hour as well. 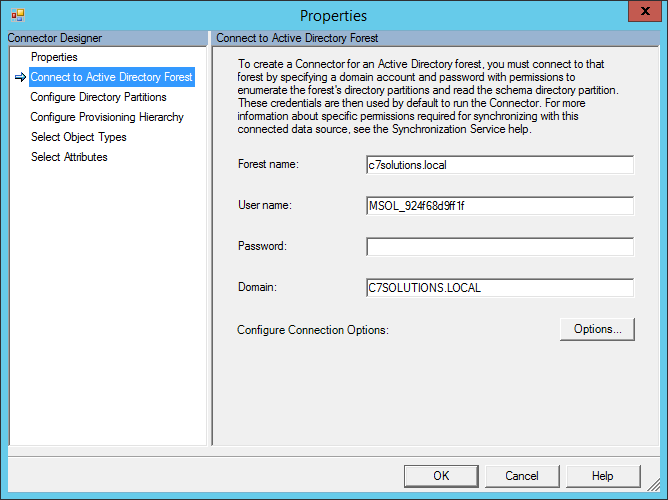 So you could for example remove the MSOL_ account(s) from older ADSync deployments and tidy up your permissions as well. If I add the relevant ACE’s here for the writeback permissions then within the hour, and then for syncs that happen after that time, the errors for writeback in the sync management console will go away. Note though that AdminSDHolder is per domain, so if you are syncing more than one domain you need to set these permissions on each domain. To script these permissions, run the following in PowerShell to update AD permissions regarding to the different hybrid writebacks scenarios that you are interested in implementing. The following PowerShell will let you know all the users in your domain who have an AdminCount set to 1 (>0 in reality), which means they are impacted by AdminSDHolder restrictions. The changes below directly on the AdminSDHolder will impact these users as their permissions will get updated to allow writeback from Azure AD. This setting is needed for all installations since version 1.1.553.0. 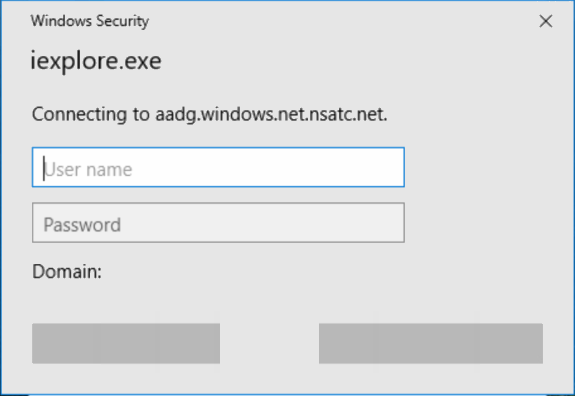 $accountName = "domain\aad_account" #[this is the account that will be used by Azure AD Connect Sync to manage objects in the directory, this is an account usually in the form of AAD_number or MSOL_number]. $cmd = "dsacls.exe '$AdminSDHolder' /G '`"$accountName`":WP;ms-ds-consistencyGuid'"
The following PowerShell will modify the permissions on the AdminSDHolder object so that protected accounts can have Self Service Password Reset (SSPR) function against the accounts. Note you need to change the DC values in the script for it to function against your domain(s). Note that if you implement this, I recommend that you use version 1.1.553 or later, as that version restricts rogue Azure AD admins from resetting other Active Directory admins passwords and then taking ownership of the Active Directory account. Often Azure AD admins have admin rights in AD, and so this was always possible independent of AADConnect, but versions of AADConnect prior to 1.1.553 would allow an Azure AD admin to reset a restricted AD account that they did not own. $cmd = "dsacls.exe '$AdminSDHolder' /G '`"$accountName`":CA;`"Reset Password`"'"
$cmd = "dsacls.exe '$AdminSDHolder' /G '`"$accountName`":CA;`"Change Password`"'"
$cmd = "dsacls.exe '$AdminSDHolder' /G '`"$accountName`":WP;lockoutTime'"
$cmd = "dsacls.exe '$AdminSDHolder' /G '`"$accountName`":WP;pwdLastSet'"
Note: Take care with this permission. Though Express Mode does this, there is a possible scenario where writeback of an AD admin password change could be misused. Versions of AADConnect released on 2018 specifically block this functionality where the user is changing a different admin user. These permissions allow the current user to make this change to their own account. The below script will set the permissions required for the service account that AADSync uses. Note that if Express mode has been used, then an account called MSOL_AD_Sync_RichCoexistence will exist that has these permissions rather than being assigned directly to the sync account. 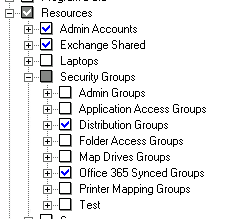 Therefore you could change the below permissions to utilise MSOL_AD_Sync_RichCoexistence rather than AAD_ or MSOL_ and achieve the same results, but knowing that future changes to the MSOL_ or AAD_ account will be saved as it was done via a group. $cmd = "dsacls '$AdminSDHolder' /G '`"$accountName`":WP;proxyAddresses'"
$cmd = "dsacls '$AdminSDHolder' /G '`"$accountName`":WP;msExchUCVoiceMailSettings'"
$cmd = "dsacls '$AdminSDHolder' /G '`"$accountName`":WP;msExchUserHoldPolicies'"
$cmd = "dsacls '$AdminSDHolder' /G '`"$accountName`":WP;msExchArchiveStatus'"
$cmd = "dsacls '$AdminSDHolder' /G '`"$accountName`":WP;msExchSafeSendersHash'"
$cmd = "dsacls '$AdminSDHolder' /G '`"$accountName`":WP;msExchBlockedSendersHash'"
$cmd = "dsacls '$AdminSDHolder' /G '`"$accountName`":WP;msExchSafeRecipientsHash'"
$cmd = "dsacls '$AdminSDHolder' /G '`"$accountName`":WP;msDS-ExternalDirectoryObjectID'"
$cmd = "dsacls '$AdminSDHolder' /G '`"$accountName`":WP;publicDelegates'"
$cmd = "dsacls '$AdminSDHolder' /G '`"$accountName`":WP;msExchDelegateLinkList'"
Once these two scripts are run against AdminSDHolder object and you wait an hour, the permissions will be applied to your protected accounts, then within 30 minutes (based on the default sync time) any admin account that is failing to get cloud settings written back to Active Directory due to permission-issue errors will automatically get resolved. Got this error the other day at a client and found nothing listed on Internet search for it, which of course means only I have this issue! But even so, lets get to see what it means and how to fix it. The error turned up in the AADConnect tool and it reported sync-generic-failure on the Delta Synchronization stage when pulling data from Active Directory. Following the above error was the entire stack dump of the issue (a few pages of errors) which are visible by clicking the sync-generic-failure link in AADConnect and clicking the Stack Trace button. Buried inside the stack dump are a few “InnerException” errors. These point out the real cause of the issue. Argument 1 to function DateFromNum is out of range. Not a valid Win32 FileTime. This shows that the user in question (which is listed by DN in the stack dump) has an invalid value for the pwdLastSet attribute. Now this value is valid – it is used in code and scripts to set this attribute to the current date and time, as normally this value is set by a script and so setting -1 means that you want the time for the last password set to be now. In my clients domain either the script failed or something else did not work, and the property was set and stayed at -1 in the directory. Viewing this attribute in adsiedit showed it to be <never> and double-clicking this attribute showed the value to be -1. In the end the fix was simple – we retyped -1 into the field in adsiedit and clicked OK. This time the attribute updated to the current date and time. Now that the attribute was a valid date/time, the AADConnect sync rule worked and the object was synced to Azure AD. It appears that both and are options in the sync tool. You get the first (grey with a tick ) if you select that box and untick some child objects. You get the second (grey box, no tick) if you unselect the parent and then individually select child OU’s. If you do the second option (and get )and then add a new OU under the parent it is not selected in the sync engine by default. Unfortunatly you cannot do this for the root of the domain during initial setup of AADConnect, as you need to select the domain in the provisioning wizard before unselecting OU’s). You can later go into the sync tool and change the domain to default unselected ( ) by unselecting everything and then just selecting the OU’s you need. In this way you can be sure that later OU’s are not auto selected for syncing.